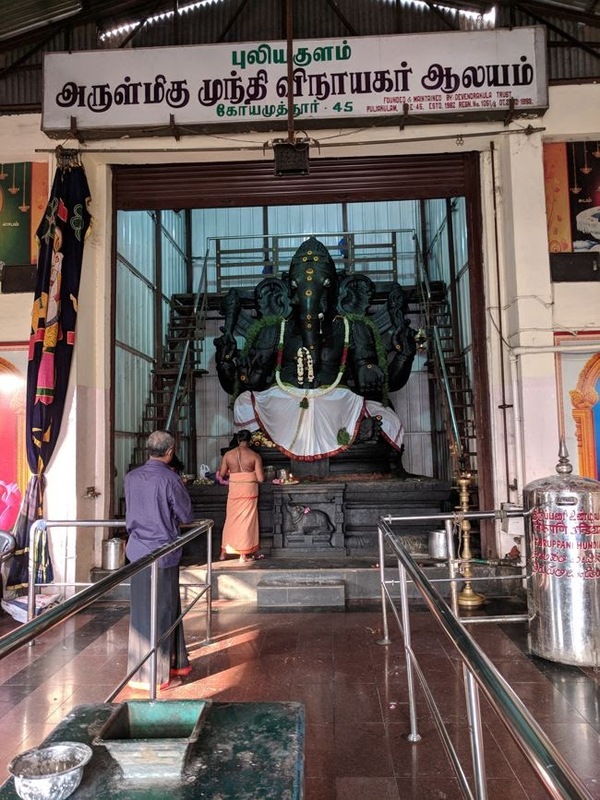 Mundhi Vinayagar temple at Puliakulam in Coimbatore is said to be the biggest single stone granite idol in Asia weighing 14 tonnes. And this temple was built in 1993 at Puliakulam that is mere 4 km from Coimbatore city centre. Vinayaga Chathurthi is celebrated with great importance when huge gathering of devotees seek blessings of this Lord Ganesha. The idol is sculpted from a single stone and is largest in size in whole of Asia. The nectar pot – Amruth Kalasa – is on His trunk while a great Lotus adores the Left foot. The majestic appearance of Lord Mundhi Vinayaka seems to be a sculptural translation of Shivagama Sastra saying “Karastha Kathalisoodha Panaseshaka Modhagam, Bala Surya Prabhakaram, Vande Bala Ganapathim”. Being under the Bodhi Satwa tree – Arasamaram in Tamil – Lord Mundhi Vinayaka showers boon falls on the devotees seeking His grace. The idol of Lord Vinayaka is huge in size. The forehead alone is 2.5 feet broad. The trunk is right circled – Valanchuzhi. Of His four hands, he holds the piece of ivory in the right hand He used for writing the Mahabharatha Epic to the dictation of Sage Vysa, Angusa in upper right hand, jack fruit in the left lower and whip (Paasam) in the left upper hand. He is holding the nectar pot in the trunk as a sign of Mother Mahalakshmi the Goddess of Wealth. The idol is mounted on phallus designed as Lotus. There is also a Lotus in His left foot. The Vasuki serpent He is wearing as a belt around His hip assures remedy from the adverse aspects of the serpent planets Rahu and Ketu. As He appears as male from the right side and a female on the left, He looks Lord Arthanareeswara combining Lord Shiva and Mother Parvathi. In size, Lord Mundhi Vinayaka is the largest idol in the Asian continent. 21 skilled sculptors put in their might in making the idol. The choice of the stone was also not easy. They searched in many place and finally picked up a huge rock in Oothukuli near Coimbatore from a pit 20 feet deep free of any flaw. They designed there itself with some approximate calculations. It took six long years to make the idol and the sculptors working very devotionally with a mind of penance. The idol is 19 feet 10 inches tall and 11 feet 10 inches broad. He was brought to this spot on a cart specially made for the purpose. A slanting track was made with perfect calculations to lift the idol to the point of installation which took 18 days. No machine was employed for lifting. It was only manually done with chains and ropes and rolling balls. Sankastahara Chaturthi each fortnight is duly followed in the temple. 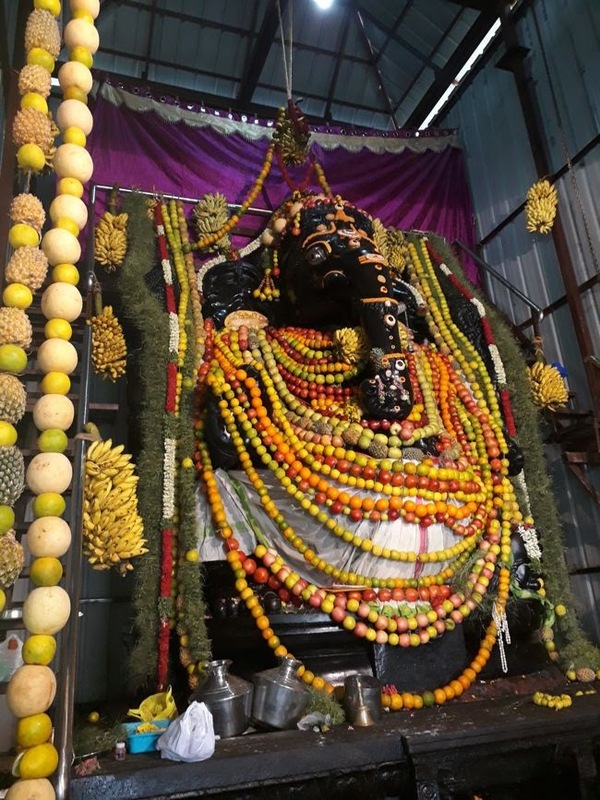 Tamil new year day – also called Chithirai Kani falling almost on April 14 each year is very grandly celebrated with such devotion of dressing the Lord (Alankaras) with fruits and vegetables weighing as heavy as about 5 tonnes. After performance of the New Year puja, these are distributed to devotees. On the Vinayaka Chaturthi day occurring in August-September, abisheks to Lord begin at early hours of the day. The garland is made of flowers weighing about 3 tonnes with princely dressing – Raja Alankaram. The devotee crowd will be in thousands this day. Navarathri also is grandly celebrated in September-October. The Alankara beauty would be such that mere two eyes are too insufficient to enjoy majestic darshan of Lord Vinayaka. Mundhi Vinayakar temple is located in the area of Puliakulam which is 4 Km from the Coimbatore city center. The temple is on the middle of the conjunction of Puliakulam Road, Sowripalayam Road and Pankaja Mills Road. Puliakulam is a residential neighbourhood in the city of Coimbatore. It is one of the oldest villages in the city of Coimbatore. 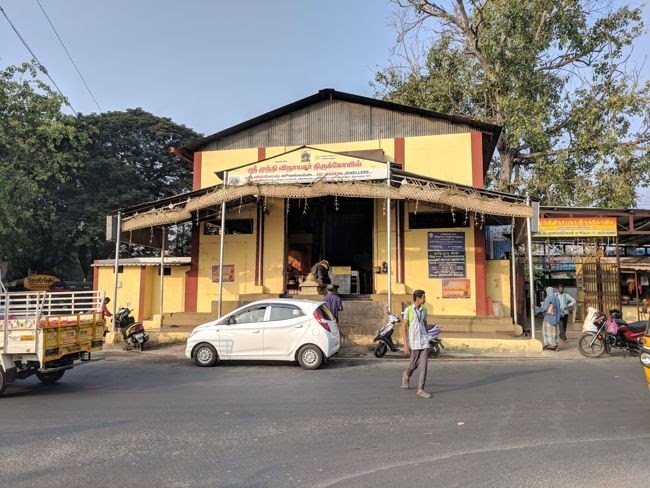 Puliakulam is situated just 4 km from the heart of city (Townhall and Gandhipuram), and only 3 km to railway station and 8.5 km to Coimbatore airport. It borders with Papanaiken palayam in the North, Meena Estate in the East, Ramanathapuram in the South and Race course in the West. The two national highways NH 47 (Avinashi road) and NH 67 (Tiruchy road) are just 0.5 km away.